Disclaimer: I am not a certified fitness professional. Please consult your doctor before undertaking a new exercise program. Workouts on Iron Rogue are provided for inspiration and discussion. You may remember from 2 weeks ago that I've been emphasizing strength training in the last little while. 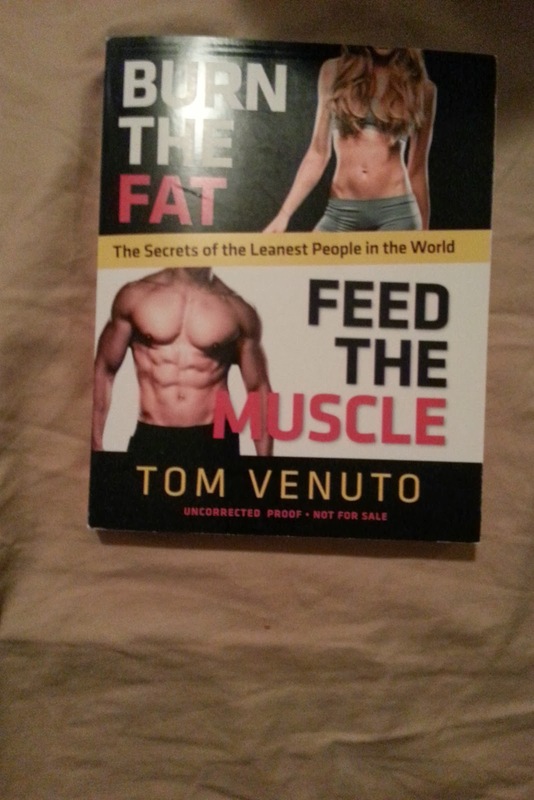 The workout I've been using is based on the Muscle Primer workout from Burn The Fat, Feed The Muscle by Tom Venuto. The Muscle Primer workout is a whole body workout that Mr. Venuto prescribes for beginners to get ready for more weight-lifting. I thought I would do it for 3 weeks then move on to workouts that were divided up into back/arms, chest/shoulders, and leg days. Unfortunately, that's not how Burn The Fat, Feed The Muscle is designed, and they recommend sticking with the Muscle Primer for 3 months (up to 6!) and that's doing it 3 times a week, when I've been closer to twice for the last 6-8 weeks. I do my workouts at lunchtime at work, and lately there have been training courses, meetings, and a heavier workload getting in the way of my workouts. One of my pet-peeves with weight lifting is how it can take longer if a particular piece of equipment (even a bench) is occupied by someone else, and how setting up weights on bars etc. takes extra time. A few times I've wanted to get in and out as quickly as possible. Pair exercises in such a way that they can be done back to back; with little overlap between muscle groups, one muscle group rests while the other is working. 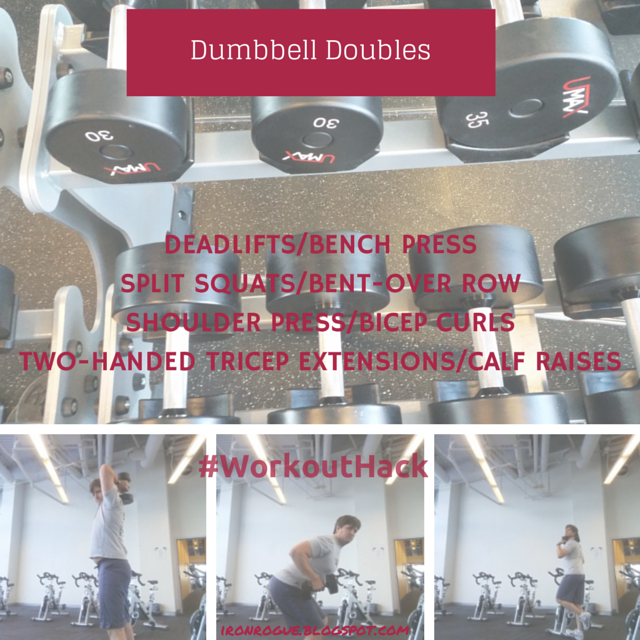 Pair exercises in such a way that the same dumbbells can be used for both exercises without having to go back to the rack and seek out different ones. Use as little extra equipment as possible. Deadlift/Romanian Deadlift - These are great for posterior chain (used for going up hills). I do Romanian Deadlifts when I'm not confident about the weight I'm lifting, and I think they're beginner-friendly for starting to lift. Bench Press - OK, you need a piece of equipment here, but luckily between flat benches and adjustable benches, you can usually find something in a gym. These two represent the exercises that I can do with the heaviest weight. 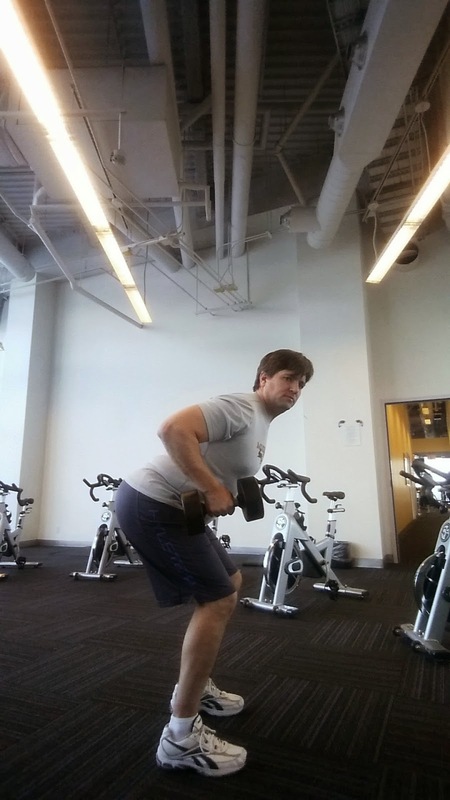 Split Squats - These are like lunges without stepping forward (or back). I'm not comfortable elevating my rear foot very much, but sometimes I'll place it on a step or even the foot rest of a piece of equipment (bench, rack). Bent-over Rows - These can be done single arm with a bench, but I prefer to stand bent over with weights in both hands (see pic). They take the place of the lat-pulldown which I've been using for back strength when I have time for longer workouts. 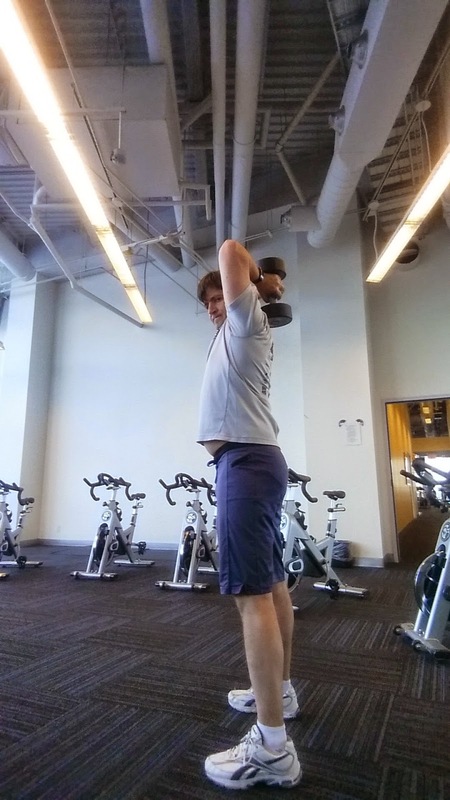 Bicep Curls - I generally alternate arms. These complement each other from a push vs. pull perspective. The triceps are being used in the press, but they get to rest during the bicep curls. Calf Extensions with a Dumbell - I'm not in love with this one as I find most calf-exercises a little awkward. On days where I have time, I break my own rules and use a machine (leg press). Still, you can mount a weight on your shoulder and put your foot on any raised surface (provided you feel good about your balance). I'm using a spin bike in the pic, but the foot of a bench or a step would be fine too. Notice I put the weight on the opposite shoulder to the leg I'm doing the calf raise with. Now, everyone has different strengths and weaknesses, so using the same dumbbells for each exercise might not make sense for everyone, however, I think I have a fairly typical build/strength profile (especially for a runner/triathlete) with more lower body strength than upper body strength, so I don't think these pairings are too "out-there." Moreover, you can vary the reps you do as long as they stay between 6 and 15 (8 to 12 being even more ideal). I did two sets of each: each "double" or pair twice. I tried to not stop in the middle of a double, and also not too much between sets. I rested a little between doubles, but not too much, usually just enough to replace the weights and grab new ones. The good news is the major muscles fatigued by one exercise never stopped me from doing an exercise, the only thing holding me back was getting gassed cardiovascularly, or needing to rest my hands due to lack of grip endurance. So while I'm not going to label this a HIIT workout (I wouldn't know the rules of what constitutes that exactly), you can see it will get your heart rate going well, while building muscle. Official time from that "dress rehearsal": 14 minutes 36 seconds. 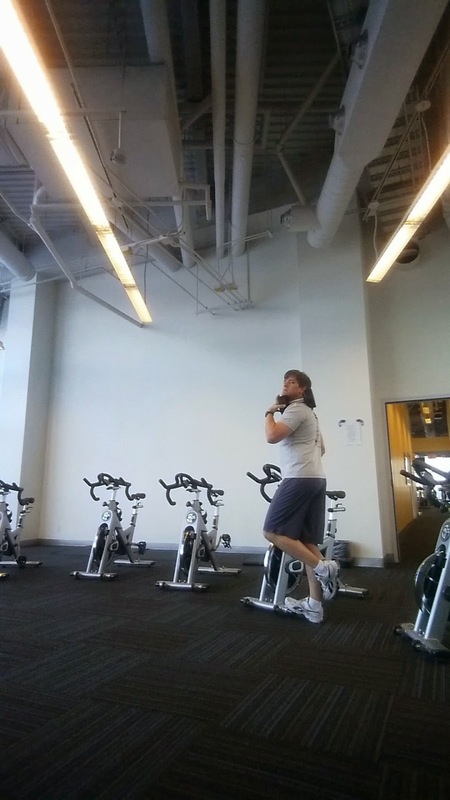 I did 3 minutes on an elliptical (though I prefer a rowing machine - it was occupied) as a warm-up, and a minute plank on my way to the change-room. Iron Rogue Out! What do you think? Do you love dumbbells?